Lexus has a strong presence at the ongoing Kuala Lumpur International Motor Show (KLIMS), showcasing two new models that will go on sale in the near future. While the UX crossover is a little further off, the new ES is being shown in local ES 250 guise, suggesting an imminent launch. Moving onto its seventh generation, the latest ES debuts a new, sportier design for the traditionally frumpy four-door. 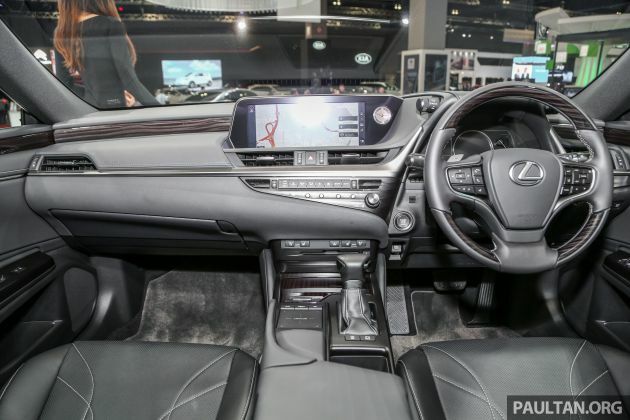 It rides on the modular Global Architecture – K (GA-K), essentially Lexus’ version of the Toyota New Global Architecture (TNGA) that also underpins the new Toyota Camry and Avalon. As such, it benefits from a lower centre of gravity, with the resultant proportions giving it a sleeker look. At the front, the trademark spindle grille has been made more aggressive than ever before, with flowing fin inserts. The slim headlights, sharp crease lines emanating from the grille and sculpted surfaces give the car a more expressive look, while the more rearward positioning of the A-pillars and the fast rear windscreen rake provide a more dynamic silhouette. 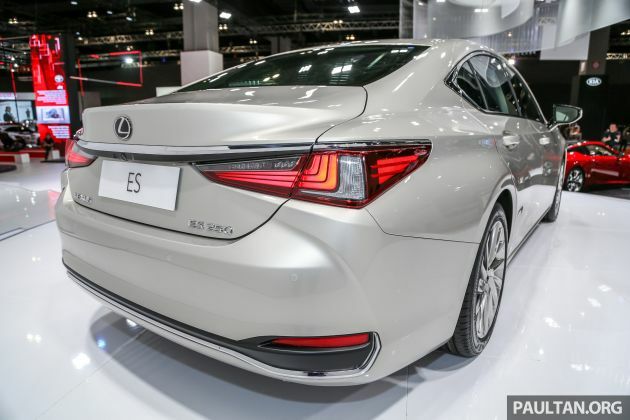 Moving to the rear, the ES adopts the typical Lexus triple L-shaped tail lights, plus a wider stance from the rear wheels. The new looks betray the adjusted dimensions of the new car, which now measures 4,975 mm long, 1,865 mm wide and 1,445 tall – figures that are 66 mm longer, 46 mm wider but five millimetres lower than the outgoing model. The 2,870 mm wheelbase is also 51 mm longer. Inside, the ES sticks the template set by the new LS, complete with sweeping curves and a large 12.3-inch centre display linked to the latest Lexus Remote Touch interface. The show unit features matrix LED headlights, 18-inch Resonator alloy wheels, a head-up display (said to be the largest in its class) and a seven-inch instrument display. No digital side cameras here – those are reserved for the Japanese market. Aside from blessing the new ES with a more low-slung aesthetic, the highly rigid GA-K platform is also said to imbue the car with a more athletic nature, with double wishbone rear suspension, optimised overall geometry and a rack-mounted electric power steering system. The passive dampers feature an ultra low-velocity swing valve (a world first) to respond to minor surface imperfections. 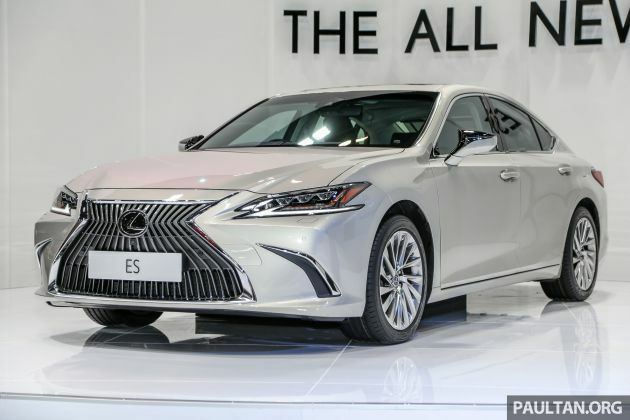 Safety-wise, the ES comes with the Lexus Safety System+ suite of driver assists, including Pre-Collision System autonomous emergency braking, Dynamic Radar Cruise Control with Lane Tracing Assist (LTA) that allows the car to accelerate, brake and stay in its own lane semi-autonomously, Adaptive High Beam System (AHS), Road Sign Assist (RSA), Parking Support Brake System and a Panoramic View Monitor. Power comes from the new 2.5 litre Dynamic Force direct-injected four-cylinder petrol engine, making 204 hp at 6,600 rpm and 243 Nm of torque from 4,000 to 5,000 rpm. It is paired to an eight-speed Direct Shift automatic transmission. Glorified and way more expensip Toyota Camry. Answer to economy of scale. Too bad new Camry buyers get shafted by Toyota. If Dynamic Force engine is available for Camry, then who will buy this overpriced? ideally in USA, the Lexus ES starts at $35k only and then the Camry $24k. This Motor Show is mainly for Japan & Local car maker? Why I can’t seem Europe brand like BMW, Merz, Audi, VW and etc?